We live in an ever increasing changing world. Stakeholders’ expectation is changing like chameleon skin. For this singular reason, the entire business operations and processes need to change fast to accommodate this changing demands. The old toll free numbers system may not be sufficient enough to do this and in actual fact it is giving way to extra demand. What is wrong with them (and they will still be useful) is that they often keep customers waiting. Today, speed is the word. ‘Please hold the line for one of our agents’ is gradually infuriating the brand consumers. We acknowledge this has its own place. Unfortunately many service industries here do not have this basic service. Customers pay to reach them. If in doubt, ask Banks, Insurance, Airline companies etc. Today’s customers are often impatience with phone call, emails, fax. They demand real time action and response wherever and whenever. The demand for speed today is the major driver of business to be social. Being social is inherent in human nature. It is not just springing up today. I like the way JP Rangaswani defines being social. He said ‘’Social is about bringing being human back into business, about how we conduct business; about why we conduct business. Social is something in people’s hearts, in people’s beings, in their DNA’’. At the heart of all this is the demand for business operations and processes to make necessary change. After all, business is about people not about products or machine. So why is business still in anti-social mode? An online writer identifies the challenge of this corporate behaviour by saying ‘the single thing holding most companies back from providing social customer service/business is the inability to see customer service as an asset instead of a cost’. Some businesses inadvertently turn up historical relationship around by seeing customers in term of numbers. In some cases, most staff at the branch offices are nothing more than Automated Teller Machine (ATM). They are not allowed to take initiative but to obey commands. Many will argue against this but just keen observation of corporate process, one will confirm this truth. Given this background, why is it that an organization is doomed today if it remains in the anti-social mode? Customers/stakeholders want a business process that focuses around them not around the brand: Stakeholders expectation and demand are changing fast. They want what they want, when they want it and where they want it. Many hate to be kept waiting for your customer service agents for more than five minutes on your toll free lines listening to product adverts. They want to ask question on your social platforms and get response within seconds. That shows you care. American Airline and SouthWest Airlines have received great reviews for this. Stakeholder wants corporate staff that gives them attention and makes them feel important: Even though many will not check their mails, sending mails to ask after their well being or a text message with a motivational charge for the week shows you care and have them in your mind. That may cost you more money and time but you achieve better result. 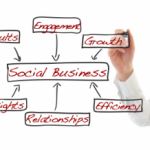 There is an urgent demand today that business becomes personal and social. It is true many businesses were not born personal or social. Many corporate organizations take their cue from the ‘GodFathers’. But the ‘Godfathers’ were wrong when they shouted at you with a slogan ‘business is not personal, in other words not social’. The reason is that unfortunately, people who will keep the business alive are born social or personal. They constantly crave for solid relationship. Excellent study, I simply passed this unique onto any colleague who was simply doing just a little research in that. And the guy actually ordered me dinner because I stubled onto it for him happy So allowed me to rephrase that. This is coming at the right time, perhaps to serve as a reminder to corporate giants that consumers are real people not data in their storage systems. Simply put, it all boils down to one word; humility. When every consumer irrespective of status or stigma is treated with respect, it goes a long way to reinforce mutual trust and engenders brand loyalty. Gone are the days of treating consumers with impersonal feelings and sometimes disdain, now you do that at your own peril.